Mustang’s marketing materials say that the fragrance “embodies the spirit of the Mustang man while remaining true to the values of manhood and legend of the Mustang brand.” As far as the “values of manhood” go, I’ve only known two Mustang drivers. One was an accountant for the federal government who complained nonstop about his aching back. The other was my uncle, who now owns a dry cleaners in Sparks, Nevada, and he didn’t have the Mustang past his twenties. Neither man was known for tearing it up. Over the years, Mustangs — like Old Spice before it — were co-opted by men, and Mustang for Men reflects that. Few secretaries will be wearing this one. 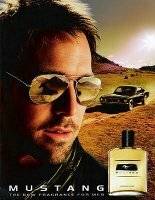 Mustang for Men, released in 2007, has notes of lavender, ginger, lemon, pipe tobacco, cedar wood, amber, fir balsam and patchouli and is labeled a “rugged oriental.” Whatever they call it, I like it. “Rugged” is right on. Mustang is assertive and woven from thick swathes of fragrance notes. It feels more like a chunky mosaic of scent than a fine mixture. “Oriental” captures the fragrance’s tobacco and amber. I’d add “fougère” for Mustang’s dominating minty lavender, which is unexpectedly — and successfully, I think — set head-to-head with ginger and lemon peel. Sweet pipe tobacco, wood, and amber warm Mustang’s heart, with barely discernible patchouli helping out. Still, the fragrance retains an unpredictable spicy freshness. Cedar can be strident and even hint at body odor, but it doesn’t solo here. Neither does fir balsam, although it fuels the fragrance’s masculine feel. Mustang has massive sillage and lasts hours on my skin. I expected it to flatten to amber as it dried down, but it kept a strange and interesting herbal cast all the way to the end. Mustang for Men may not work for every man, but my guess is that it rumbles like a finely tuned V-8 on the right man. (Ouch! Sorry.) I imagine it on a beefy guy who gives vice-like bear hugs. If you have the presence to pull off a demanding scent, Mustang is worth trying. It’s better than a lot of men’s fragrances I’ve smelled at triple the price. Next up, I’d like to see a cologne named after a Ford Ranchero. What about you? At Walmart, Mustang for Men cologne spray is $24 for 50 ml. Um, what are the Values of Manhood again? There’s always the Honda Accord! Sounds interesting. I’m guessing there will be no fragrance soon for minivan-driving Dads. Probably not until we get some super cool dads out there in minivans who can manage to get their photos in the media. Either that, or until Bentley makes a minivan. My mother drives a bright red mustang, this is hilarious. It sounds good though, just don’t think I could get past the bottle and name. However, I just Googled “Mustang For Men” and found out it was done partnership with Estee Lauder! How surprising. Maybe you could decant it, if you loved it enough. Or maybe your mother would like it! Chandler – that’s right, I had forgotten that it was Estee Lauder! I was scrolling through one of the online discounters and was surprised to see it come up as one of their fragrances. In fact … I think there may even be … a Mustang FLANKER! Wild Mustang, Mustang Stallion (more Manhood Values), they practically name themselves! And for the ladies … My Friend Flicka. Hey, if they can do a Ford Mustang, they can surely do a Ford Ranchero. I’ll put that out there again. What notes do you suggest for a Ford Ranchero scent? The interwebs (they would never lie say that Elvis had one, so the possibilities are endless. Oh boy, with Elvis that really opens it up. How about motor oil and fried bananas for starters? Heh, heh. My parents had a ’68 Mustang, which they bought new and later handed down to me. That was the car I learned to drive in: V8, automatic, power steering, blasting AM radio . . . good times. I’m glad to hear that its namesake scent is worth a sniff. Nice! I learned to drive in an early 1970s Ford LTD with a white vinyl roof. It was ancient and creaky. A tank. Sorry y’all, but the first thing I thought of when I read Mustang was horse manure. Always a fascinating note in fragrance. For real! There IS a Mustang flanker! Mustang Blue. Finding this out has made my day. I wonder how it is? Now I’m curious! Angela, your uncle is in my neighborhood, I am curious what dry cleaners it is, lol:). I never trust dry cleaners. see Seinfeld episode where woman wears clothing, lol. I heard there is a good one in Sparks though..wonder if it’s the one I am thinking, lol..don’t remember the name. But this scent I have not tried. I think I have sniffed Corvette? I think that’s what it was called. Idk. Don’t remember thinking much of it but I will give Mustang a try:). I’m sorry, I can’t remember the name of his dry cleaning place! I know it’s in a strip mall, but that’s all. Corvette–of course. They’d have to do one called Corvette. It may be the one I am thinking, idk. That’s ok, lol, I was kind of looking for a good dry cleaners:D.
I could totally see ‘Thunderbird’ doing well around here, lol. I love Thunderbird. Yes, that’s a great one. * Or good ol’ Redneck Pick-Up Truck:D.
Sure to find an audience! Maybe with a pork rind accord, too. Haha! LOL, pork rind accord, you got that right and some good ol’ chew tobacco. Pork rind accord, lol.